New Jersey Revolution Radio maintains partnerships with organizations and individual activists in order to promote the arts and anti-capitalist work. This network plays a critical role in what we can do at this grassroots media network. We strive to break down silos put in place by the current establishment and create solidarity among the working class. 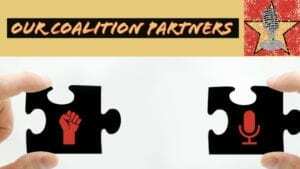 Our partnering organizations are encouraged to fight white supremacy and the negative effects of capitalism through our relationship. Partnerships can include website design services, consulting services for activist organizations, writing services, speakers, event planning, and more. If you are interested in partnering with New Jersey Revolution Radio, or if you have any questions please contact us! Meet the revolutionary organizations creating new formations around The Garden State. HNH obtained consultative status with the United Nations in 2016 and works to bring real systemic change to drug policy in New Jersey and around the world. One People’s Project’s mission is simple: to research and report on who’s who and what’s what regarding right-wing groups, individuals, and activities. We encourage society to be vigilant against them in an effort to diminish their ability to function. People Over Pipelines was established to help fight the proposed Garden State Expansion project along with the Southern Reliability Link Pipeline. These projects threaten our communities in NJ as well as the NJ Pinelands. For people in South Orange and Maplewood, NJ that support freedom and justice for Palestinians. There is zero tolerance for racism, white supremacy, or anti-Semitism. This is a page for constructive and productive learning and action. Zionism is not Judaism. “True peace is not merely the absence of tension; it is the presence of justice.” - Dr. Martin Luther King Jr.
15 Now NJ was the first organization in the state to call for a 15 dollar minimum wage. The passage of a minimum wage bill in 2019 was not the end. We continue to fight the slow phase in and loopholes put into the bill. We also advocate for stronger worker protections across the board. Can you help New Jersey Revolution Radio grow this network of grassroots organizing? Please chip in what you can!